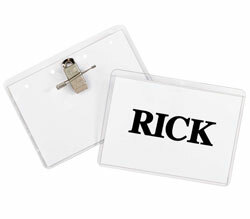 Not only can you create impressive name badges instantly using your laser printer, you can make address labels and more with this versatile product. All white, no border. Compatible with all industry standard label software and comes on 8 1/2 x 11 sheets. Built-in templates in Microsoft Word and Corel WordPerfect. Pressure sensitive badges should not be applied to vinyl, leather, suede, corduroy or silk. 3 3/8 x 2 1/3. 200/BX.